Our teacher Matt led us to the Museum of Fine Arts yesterday. It was a huge and amazing museum. 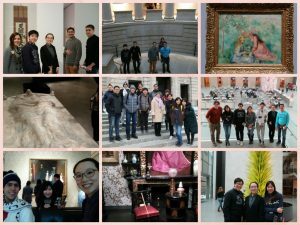 We enjoyed looking at the different paintings, and taking pictures with each other. Matt explained the different art work and pictures to us, and that helped us understand the background and the history of them. The museum contains different countries’ history and culture so you can choose to look at whatever you want. I liked the European pictures area because I felt like they brought me to other countries and eras.